When I sent my mom a picture of this jumper she said, “You used to wear stuff like that all the time!” That made me feel like this style is a little dated, but jumpers are in right now right?? It doesn’t matter. I think it’s the most adorable thing I’ve ever seen. I started thinking about making one when I was at Target at the beginning of the summer. 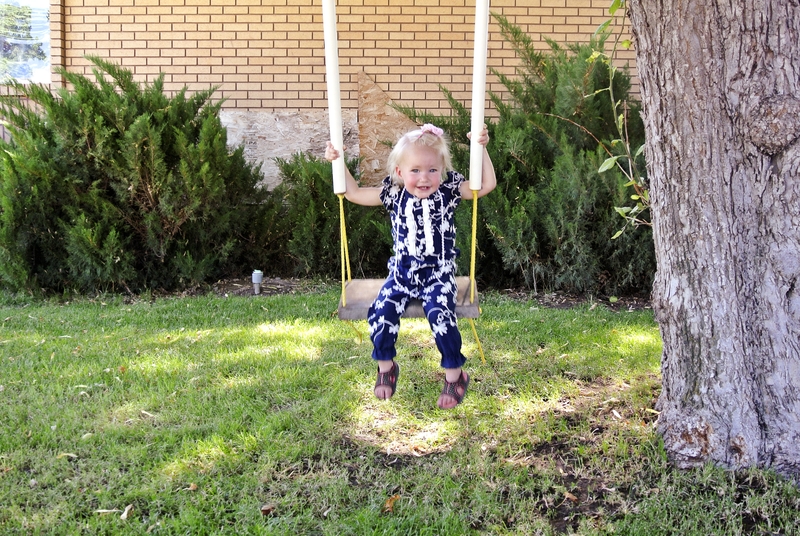 They had these cute knit jumpsuits and I wanted one for Claira so badly. Unfortunately they didn’t have her size and I left a little sad. That same week, I came home with this embroidered material thinking that I would make her a dress or one for me. 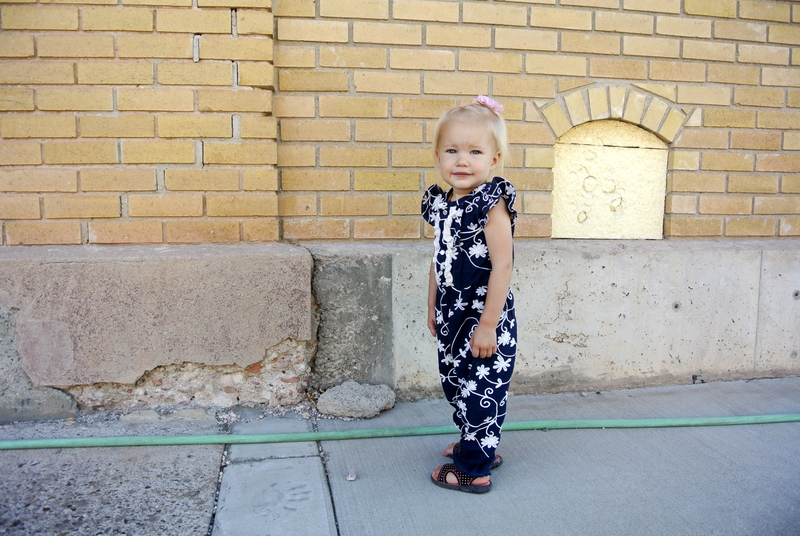 It took a while, but I finally decided it would make an awesome jumpsuit. It’s not knit, but it isn’t too stiff either. It turned out exactly how I wanted it to. I am sooo happy with this project. I made this a month ago and I just haven’t wanted to get this post together. I’ve tried on multiple occasions and it just made me want to go to sleep. Lol. Maybe my tutorial content is more boring than I thought. I took a lot of pictures, but the only time I can work on this stuff is at night in a dark room so excuse my photos. I know they aren’t the best. You can always zoom in on them for a little clarification. I basically just took a top pattern and added buttons and a bottoms pattern and added width so they would be gathered and full, then sewed them together at the waist with an elastic encased in the middle. Easy right? Well my steps might make it look complicated, but that’s just because sometimes I do things the hard way for no reason at all. If you are at all interested to see how I do what I do with no patterns… here we go! Trace a pair of pants that fit your child. Trace both the front and back. It is a little hard to trace the front as it’s smaller than the back, but creative folding can make anything happen. Remember that pants aren’t straight at the top. They dip down in the front for comfort and they raise up at the back to fit a little bum. Make sure that the side seams are the same length. (Marked in pink) This will make your pattern go together much more smoothly. If I were making a regular pair of pants, I would stop here and use this pattern. However, since I don’t want to have a side seam, I place my pieces together at the side seam and make one continuous pattern for each leg. There is a little overlap in the middle to take out the seam allowance that we no longer need. Here is the finished leg piece. If I wanted to make a simple legging, I would stop here. Since I want these to be gathered I cut my pattern piece in half and add 3 inches between them and trace a new piece. This step could probably be avoided if you just use your 2 original separate pieces from step 3, but I also wanted a legging pattern for future so I though you might as well see that too 🙂 I did make the top of the pattern straight instead of curved because…. 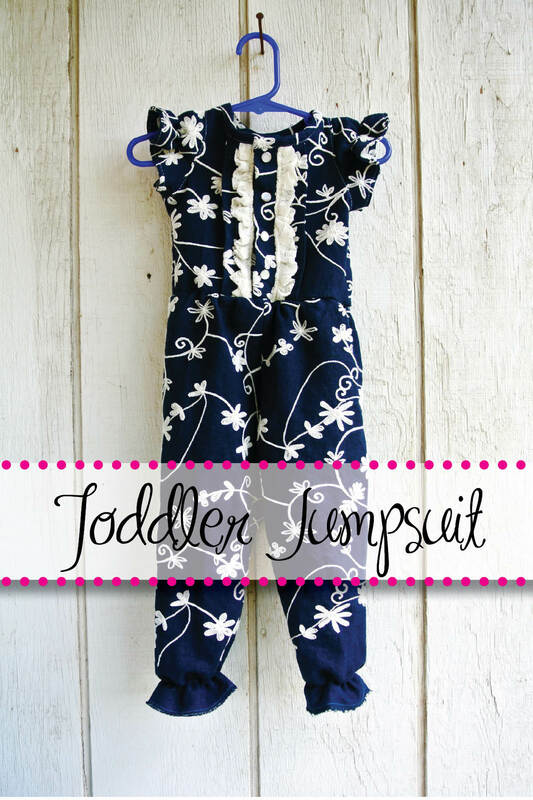 it’s a jumpsuit and not pants and it will be easier to sew together. When you are cutting out a leg pattern that includes both sides of the leg, be sure that you fold your material in half so that you either have 2 right or wrong sides together when you cut. This ensures that you make 2 opposite legs instead of 2 of the same leg. I have made this mistake more times than I can count. If you can’t fold your material, just make sure you flip your pattern piece over before cutting your second leg. I also cut out my pattern with an extra couple inches added tot the top as well as the bottom just in case. Put your pieces right sides together and sew the back and front crotch curves just as you would in a regular pair of pants. Open up your pants so the look like a pair of pants and sew up the inside of one leg and down the other inside of the other leg. I should have had a better picture of this… Sorry. Now you have a pair of pants! Now for making the bodice/top of the jumpsuit. Since I wanted flutter sleeves, I added 2 inches on the fold of me sleeve pattern for gathering purposes. I cut out 4 of these pieces so that they would have a facing on the inside. 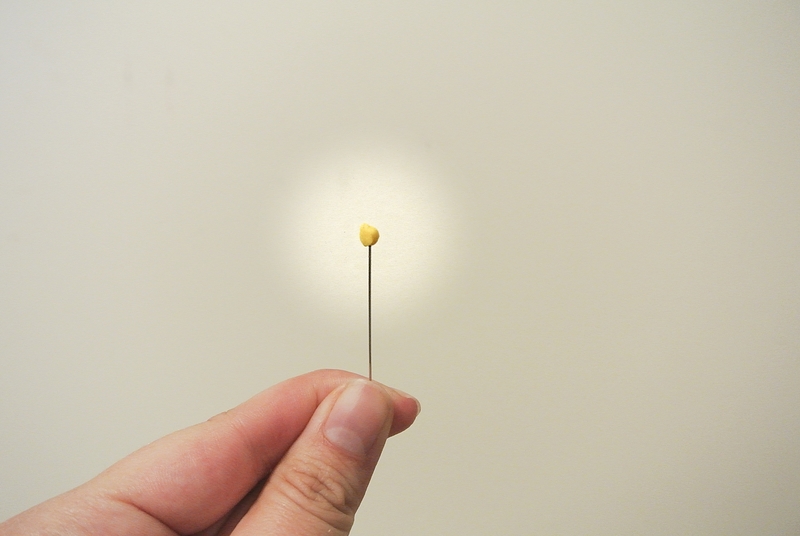 Place 2 pieces right sides together and sew around the edge as shown by the dotted yellow line. Flip your pieces wrong sides together, iron and top-stitch. 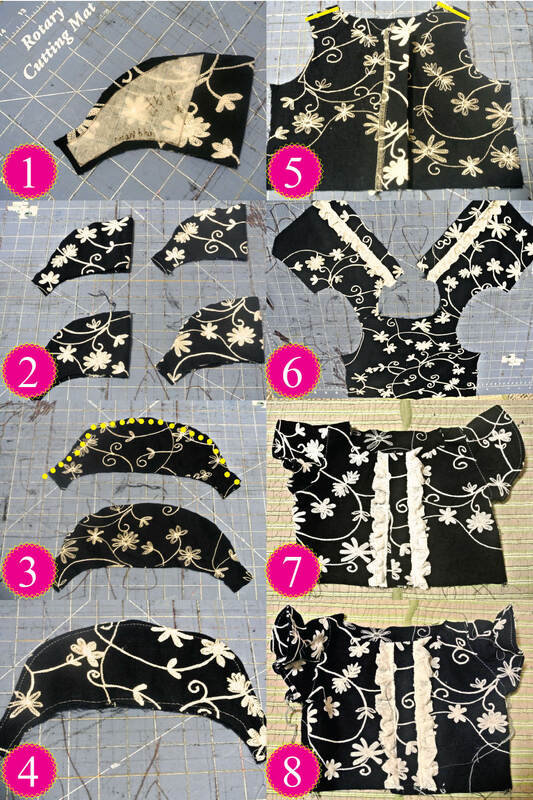 Sew your 2 bodice pieces together at the shoulders. Make sure you have some way to open up the bodice like buttons or a zipper so you can get your jumpsuit on. This is what it should look like when laid out. 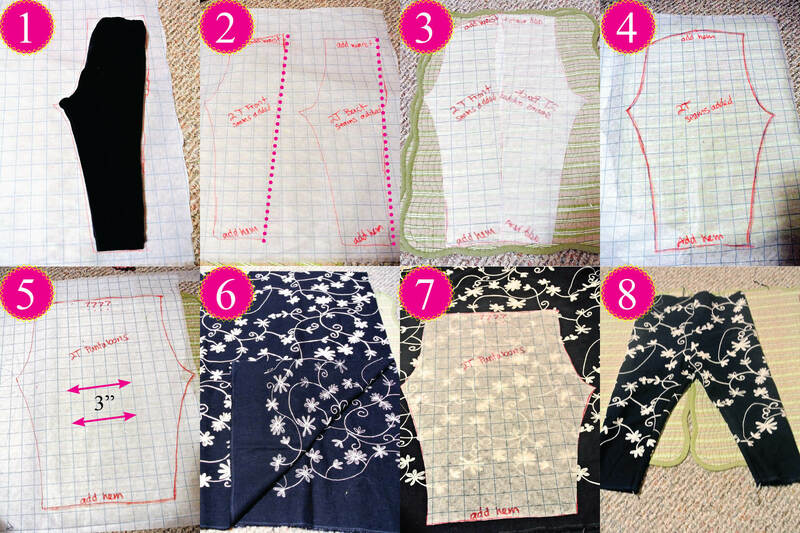 Sew your sleeves to your bodice. Dor some reason, my sleeves didn’t turn out the way I wanted them to AND my bodice was too wide. I ended up adding pleats to the front around the button placket and sewing in some elastic to the sleeve to make it more gathered and fluttery… I don’t think you should have this problem… I was just sewing late at night and measuring incorrectly. Ta-Da! Now you have a bodice. You still have a bit of work to do on the bodice such as adding bias tape to the neckline and putting on your buttons. I got lazy and had some pearl snaps so we ended up with snaps instead of buttons. Actually, snaps are so much easier to install as well as use so I might just be replacing buttons with them from now on! Sandwich it over your neckline ans sew into place. 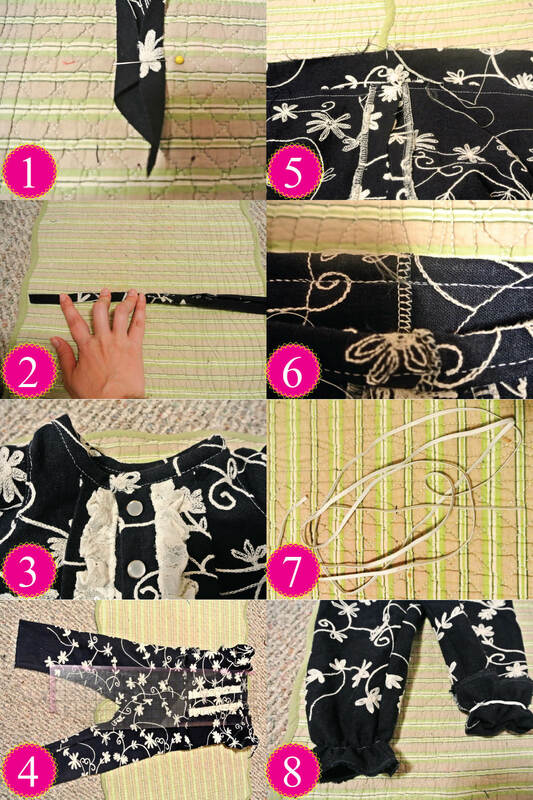 There are many detailed tutorials on how to make and sew bias tape. I would recommend checking them out. Before sewing your bodice to your pants, be sure that you measure your child from shoulder to crotch and make sure that you are giving them enough space in the body. I added about 2 inches from my measurement and that ease seems perfect for playing and not getting too uncomfortable. I wanted my elastic to be entirely encased so it wasn’t itchy for my toddler. Here is where adding those extra inches came in handy. You can kind of see how when I place my pieces right sides together my pants were actually sticking up past my bodice about 1 1/2 inches. I sewed it that way so that I could then go to step 6. Here is where I folded that extra allowance over twice to make a casing for my elastic and then sewed right on top of the line I just sewed the top and bottom together with. You can see in the picture that there are 2 lines of sewing in the same place. Leave a hole in your casing and thread some 1/4 inch elastic through that is the length of your child’s waist. Sew the ends of the elastic together and sew the hold closed. I made my pant legs on the selvage so I didn’t have to hem them, but here is where your would normally hem. All I did for the last step was take my 1/4 inch elastic and sew it to the leg about 1 1/2 inches up. I used a straight stitch and stretched the elastic as I went so it would gather the material and remain stretchy. I realize I may have skipped over a few things, but this tutorial assumes you know a little about sewing. I may go over basics in later posts or I might just leave you to the rest of the sewing world where there are so many great helps for all the basics. 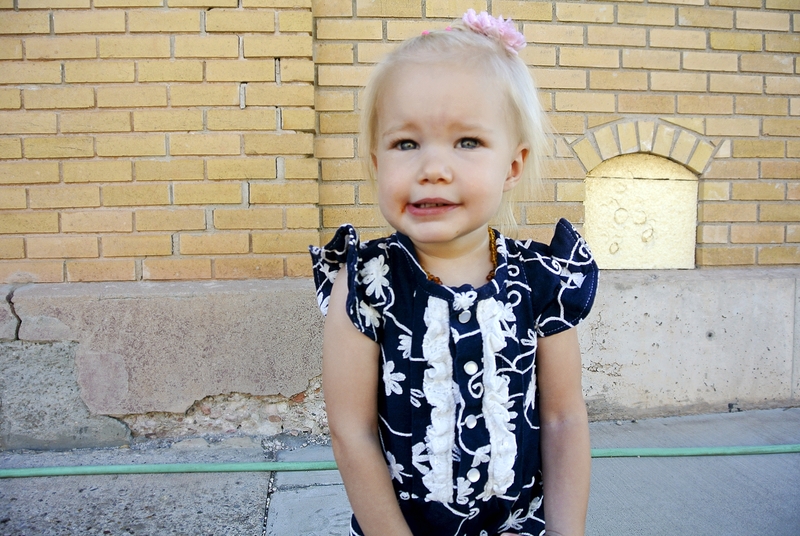 Here is the beautiful girl in all her cheesy fake smile glory. And another one of the cutie. Swinging after the parade… This girl would live her whole life on a swing if I let her. I think I will make another one of these in a cute knit. They are just adorable and I want her to wear them every day.